Kerala has seen the worst and devastating flood in it’s past 100 years. All the 14 districts have been affected by the heavy rain, flood and land slide. 3,14,391 people are living in 2094 relief camps. The people of Kerala are trying hard to survive and help and rescue as many as they can with the rescue mission teams and it’s high time the central government declare it as a national disaster. Kerala is paying high price for it’s so called political affiliation. The national media refuse to cover the gravity of the flood and the results of the calamity. Moaning Vajpayee gets much importance than the normal people of this country. The second spell of the south west monsoon hit the state on 8th August and continuing till now. The things got worse when the dam shutters, including those of Mullapperiyar had to be opened when it reached the critical point. Places like Ranni, Aranmula, Kozhenchery, Chalakkudy, Varappuzha, Angamaly, North Paravoor, Chengannoor, Jagathy etc have already been submerged in the flood and Chengannur still needs immediate attention since a lot of people are stuck in the buildings isolated by the water. Casualties have been reported from Kondotty due to landslide two days back. North Kerala and Idukki district are also affected by major landslides. Kasaragode is the least affected among the 14 districts. With rain continuing, the navy and the helicopter rescue mission team are still rescuing people from isolated areas. People are being located with the google map location service which is in co-ordination with the state government’s rescue mission. Due to the power cut followed by the heavy rain and unexpected water level rising some don’t have the access to phones to update locations but they’re also being tracked with the last available locations. Kerala is trying hard to survive with all possible measures, it needs our help though. As funds, fresh food, clothes, bed sheets, sanitary napkins and in possible way, we ought to help the state and it’s people in their attempt to not to sink but survive. 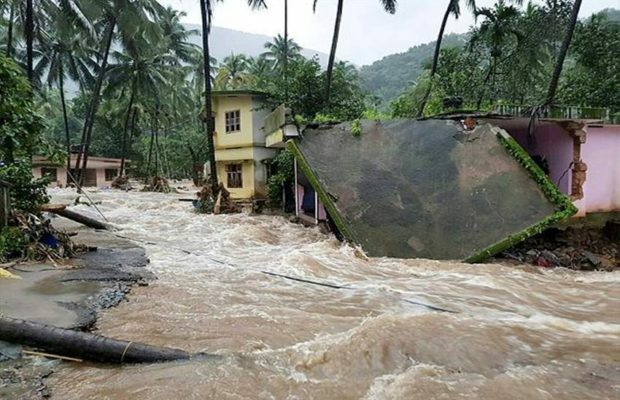 People in the camps and in isolated places face shortage of Drinking Water, Food, Clothes, Bedsheets, Sanitary Napkins etc and some of them need medical attention despite the hardest attempt of the State government, it’s rescue mission team and the people of Kerala to get things under control. Kerala Government and different organisations and independent individuals have already been rising the funds to provide maximum support to the people of Kerala. We also need to worry about the epidemic diseases that is going to follow this. The supreme court already marked the situation as grave though there was no sign from the centre to show that Kerala and it’s lives do matter. The state governments of Punjab and Telangana announced substantial financial support for Kerala. But we are afraid it might not be enough for the damage control and disaster management. The strategic approach of national media to not to cover the Kerala flood is “the high price that Kerala paid for it’s defiance” as the Supreme Court Lawyer Rebecca Mammen John stated. Kerala got 100 crores from the Central Government when Ardh Kumbh Mela, a hindu religious festival got 1200 crores as funds. We are yet to come to a point to move things to the direction to release water from the Mullapperiyaar to Tamilnadu without it affecting the lives of the people of Tamilnadu. The Kerala Government has taken initiatives to counter the fake news. The state media has shown better responsibility in saving the life of people and in updating the situations from different parts of the state with incomparable bravery. It’s high time we all spread the word maximum, get maximum support to Kerala and it’s people from within and outside India, build pressure to push the Cetre to declare it as national disaster and thus make sure we value the lives of our own people. You can donate to the Chief Minister’s relief fund via https://donation.cmdrf.kerala.gov.in AND http://keralarescue.in. All the donations are tax exempted and are under the purview of state legislatrue and is audited. Through this comment section I urge all readers to disseminate the report and similar other reports as wide as possible. Is there any scope for volunteers willing to join relief-rescue-rehabilitation efforts? Inform, please, if any. Is it possible to make a call to volunteers from other parts of India?